Tiger’s former teacher Butch Harmon, taught me unique drills for smoothing out an extra-fast swing tempo. Any one of these is ideal for curing a student’s speedy swing problem. One of the greatest pleasures of my long career in golf was getting the chance to work with Tiger’s former coach Butch Harmon on the bestselling book, The Four Cornerstones of Winning Golf. What better way to “research” a book and “work” than to converse with Butch about golf swing technique and play golf with him at my former golf club, Lake Nona in Orlando, Florida. Butch is a true teaching guru, namely because he has a great eye for spotting faults and helps amateur and pro players get back on track by teaching them extraordinary drills. Let me share with you several of Butch’s drills for curing a fast swing, which I recommend you try out on students who share the speedy swing problem common among millions of country club golfers. What follows is the actual advice Butch gave me that, again, I think you should share with fast-swinging students, particularly those who are tired of hearing only of the feet-together drill remedy recommended by a multitude of teachers. Tee up the ball on the practice tee and, with your driver, make a nice, leisurely “chip” swing. Just try to tap the ball out there about 75 yards. Hit a half-dozen chip shots like this with your driver. Next, hit some slightly longer “chips” about 100 yards, using the same slow, leisurely quarter-to-half swing. After several more of these, extend the swing slightly farther, to pitching distance, still using the driver, and hit some nice easy shots that travel a total of 150 yards. Hit about eight or ten balls this way. many balls as you like. I think you’ll be surprised that two things happen. First, when you try to smooth it out there about 180, you’ll strike the ball very solidly and hit it a lot farther than 180 yards. You’ll probably hit the ball just about as far as your best with your normal swing and a lot more consistently. Second, this entire exercise will ingrain a slower, more even tempo into your swing, namely because you have eliminated what brings the speed into the swing in the first place: the need to hit the ball hard urge. Take a middle iron and tee up the ball. Then, step a few feet to the left of the teed-up ball, and make a leisurely practice swing at an imaginary ball. Repeat this swing at an imaginary ball five times, each time stepping forward a few inches toward the actual ball, as if each of the imaginary balls had been set up in a line. Finally, set your clubhead down behind the real ball and simply make your sixth smooth, leisurely swing in this sequence. Just let the ball get in the way of that nice smooth swing. I think you’ll agree that the feeling of the swing at the real ball is a lot slower and smoother than the swings you’ve been making out on the course. This is more of a mental tip drill, but one that many golfers find helpful. Simply hum a musical tune as you make your practice swing, step up to the ball, and hit the shot. This should set you into a relaxed frame of mind to start with as you prepare for the shot. It should also give you a better chance to stay relaxed and to produce a smooth tempo during the actual swing. to stay mentally and physically relaxed throughout the swinging process. Bring this smooth, musical hum-swing to the course and feel the sense of effortless power at work. Drill: Make Your Backswing and Downswing Speeds Match A lot of golfers who swing too fast may not be too quick taking the club back, but are blindingly fast coming down. In other words, their backswing and downswing speeds don’t match. You can’t make a downswing that fully utilizes your body if the downswing is only slightly slower than the speed of light! Make a conscious effort to make your backswing and downswing speeds identical. Count to yourself as you make the swing: “one-and-two,” with “one” being for the backswing, “and” representing the top to the swing, and “two” representing your downswing. 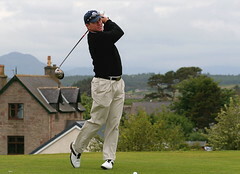 Try to swing your arms down and through the ball at exactly the same speed with which you brought them back. Don’t worry about how far you’ll hit the ball. Even though you’re swinging your arms back in what feels like a leisurely fashion, the centrifugal force built up in the shaft and clubhead will be releasing in the impact zone. You’ll be surprised how solidly and how far you hit it when you even out the tempo between your backswing and downswing. Tee up the ball. Grip a driver, then, after going through your normal pre-swing routine, simply close your eyes and swing. Give yourself a few tries to get over the anxiety that this sightless swing actually causes. I think you’ll find that your instincts for where the ball is will kick into play and you’ll start meeting the ball surprisingly well. More importantly, though, I guarantee that when you swing at the ball with your eyes closed, you’ll swing the club slowly and smoothly. It’s as though, without the benefit of sight, your subconscious realizes that you have to rely on clubhead control and good tempo to meet the ball well, and that’s what you’ll create as you swing the club. Hello, my name is Rick Saxby. I have been a Level III USGTF Certified Golf Teaching Professional since June 2005. I am now currently the general manager of Stoneybrook Golf Course in Columbia, Tennessee, and..
A collection of real-life stories and anecdotes from the service industry to provoke thought and action. This is the perfect book for golf club managers. This book is available for $19.95 by contacting our national office at 1-772-595-6490. This new book, "100 Tips for Golf Club Managers", is designed to motivate and educate golf club managers with common sense ideas and insights into the profession. This book is available for $19.95 by contacting our national office at 1-772-595-6490. If you were a golf course manager, how would you respond to the following scenarios?